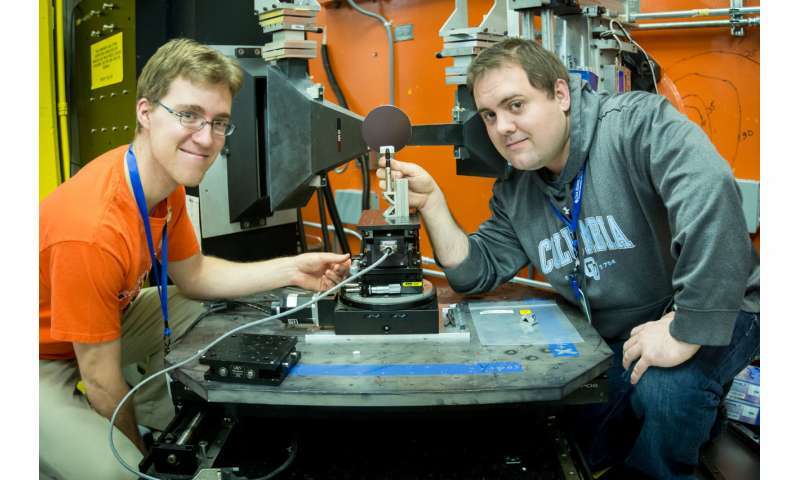 Researchers from the University of Virginia (UVA) are using neutrons to explore fundamental work in residual stress mapping that promises more precise science down the road for Oak Ridge National Laboratory (ORNL) and similar facilities around the world. Led by Sean Agnew, the group aims to obtain more accurate reflections of concentrated stress levels within a material using neutron diffraction. Residual stresses are stresses that remain within a solid material even after the original cause of the stress is removed. These kinds of stresses can occur through a variety of mechanisms, such as inelastic deformations, temperature gradients, or structural changes. Using the Neutron Residual Stress Mapping Facility instrument at ORNL's High Flux Isotope Reactor, HFIR beamline HB-2B, researchers are able to study residual stresses in steel, aluminum, superalloys, and other structural materials. The team's research will provide insight into the accuracy of residual stress mapping measurements in such materials when the neutron beam must travel large distances through the sample. Team members include UVA's Robert Klein, Matthew Steiner (now with University of Cincinnati), and John Einhorn (now with National Grid). "What we're interested in, with residual stress mapping, is obtaining the most accurate measurements possible," said Steiner. "So we have a very small neutron beam that we locate inside the sample, then we map the changes in the lattice spacing which correspond to stress in the material." "One experiment we conducted involved mapping the residual stress state resulting from casting," said Einhorn. "When you cast a metal, it cools from the outside in, so the outside solidifies while the inside is still molten. Because the inside wants to shrink as it cools, it puts stress on the outside. The outside now gets squeezed to try and match that, and that's what generates your residual stresses." The researchers are especially curious regarding whether any instrumental artifacts are producing changes in peak position measurements that could be wrongly interpreted as stress. Those kinds of discrepancies usually appear in highly absorbing materials like uranium (studied here) when the measurement location is deep within the material, and under specific conditions in which the diffraction peak shifts due to loss of the originating signal. "You need to know this so you can subtract the instrumental effects out to get the real stress level in the material," said Steiner. The research team conducted a series of experiments exploring the nature of a small shift in the HB-2B instrument's measurements that correlated to the distances traveled by the neutron beam through the sample. "As a neutron beam passes through a material, parts of the wavelength spectra get absorbed more than others, which we believe causes a shift in the instrument's measurement," said Steiner. "We're trying to figure out the reason for that and quantify how much wavelength gets absorbed." The resulting data from this research will have a great scientific and engineering impact, validating data previously obtained from certain materials on the HB-2B instrument and the accompanying peak shift corrections that have been calculated. This work will lead to improved guidelines for scientists working on beamline HB-2B who wish to measure lattice parameters of large samples that require significant in-sample path lengths, or depths. "It's a fun experiment and good, fundamental science," said Einhorn. "But more significantly, it's important, and the impact it will have will lead to more accurate science on the HB-2B instrument." Subsequent developments are enabling analytical software tools that alert researchers to situations in which certain combinations of sample and diffraction conditions pose potential problems, and in some instances, provide data corrections for improved accuracy. The team's research results were published in the Journal of Applied Crystallography.